Northern Ireland's proposed friendly match against Poland in March has been called off after they were drawn in the same Euro 2016 group. The Irish Football Association is now seeking different opponents for the game, which is expected to be part of a double-header of friendly fixtures. 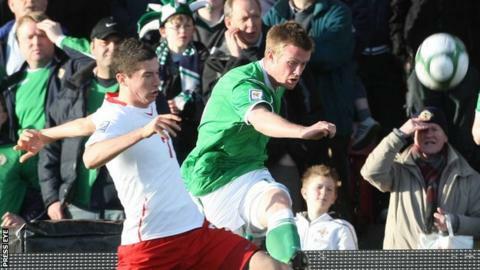 "We had made provisional plans to play in Poland," Irish FA chief executive Patrick Nelson told BBC Sport NI. "But that was conditional on us not being drawn together at Euro 2016." Northern Ireland face the Poles in their Group C opener in Nice on 12 June with the contest against Ukraine following in Lyon four days later, before the match against world champions Germany in Paris on 21 June. Manager Michael O'Neill approach both Martin O'Neill and Gordon Strachan, his Republic of Ireland and Scotland counterparts, for advice before the tournament as both countries faced Germany and Poland in their qualifying group. "We know a fair bit about Poland anyway and we obviously know the threat of (Robert) Lewandowski," said the Northern Ireland boss. "The Ukrainians are a bit more unknown to us but I think one of the real strong points of our preparation has always been our level of detail on the opposition." Northern Ireland have also been drawn against Joachim Low's Germany side in qualification for the 2018 World Cup. O'Neill added: "Germany were maybe the pot one team that I didn't want but, having been drawn in it and got my head around it, I think it's a fantastic game for us. "To get the opportunity to play the world champions in Paris in a major tournament is going to be a great occasion. "Everyone will expect them to top the group, so in many ways it turns it into a mini group of three with ourselves, Ukraine and Poland. I certainly believe we can be competitive in that company. "We proved that in qualification and we have to believe we can get out of the group." Follow reaction to the draw here. Find out all the fixtures and groups, as well as the route to the final, on our BBC Euro 2016 wallchart.